2011-06-06. Published in What's Going On? Every year, airplanes of different types take to the sky to give a give a fantastic air performance. The dates for this years Göteborg Aero Show have not yet been set, but should be towards the end of the summer. In the meantime, you can get you curiosity about everything man-made and flying satisfied by the Aeroseum, an aircraft museum located in an old nuclear bunker situatet a mere 15 minutes by bus from the city centre. Completed in 1955, more than fifty years ago, the old rock shelter resides some 30 metres below ground and measures a massive 22,000 square metres. Originally intended to shelter Swedish air force airplanes in case of nuclear attack, the underground rock shelter remained a top secret military air force base during the cold war and was later converted into an aircraft museum in 1999. Not counting the annual aero show, Aeroseum really stands out because of the fact that it is housed in an authentic old rock shelter. Exploring this once top secret air force base and imagining what it was like when it was newly built and still operational is indeed very exciting. Exhibitions about the cold war and the construction of the rock shelter further add to the feeling that you have journeyed back in time to a much harsher era, whilst at the same time maintaining a sense of distance. It is as if you are walking around in a place where time has stood still for the last 30-40 years. Even the airplanes and helicopters on display, both civilian and military, are mostly older models, although not necessarily contemporary with the base itself. Some are obviously older, whereas some are just as clearly much younger than the base. Still, to a casual visitor like myself, this does little to change the feeling of being somewhere where time has stood still for a long, long time. What further sets Aeroseum apart from many other museums is that you are actually allowed to touch several of the airplanes and helicopters on display. Indeed, they even allow you to enter the cockpit of some of the helicopters as well as the Swedish Viggen and Draken fighter jets. 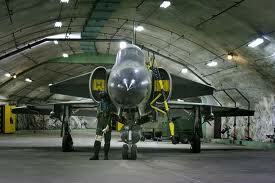 On the Viggen they even allow you to crawl through the engine compartment, should you feel inclined to do so. There is supposedly also an airplane simulator where you can try flying the civilian Commanche sports airplane and the military Viggen fighter jet for an extra fee, but this was closed when I was last there. A visit to the Aeroseum is definitely recommended, now more than every, if you are interested in seeing an aero show, want to learn more about the history of flight, old rock shelters or are simply looking for a slightly out-of-the-ordinary museum experience. Visit this page for information on how to get there. Opening hours: 1 June–31 August, Monday-Sunday 11AM-6PM. Regular prices: Adults – 80SEK. For further info and the latest updates, visit their calendar. Find Aeroseum on Google maps. Bus line 35 can be boarded at Hjalmar Brantingsplatsen and will take you to Granhäll, the closest bus stop to Aeroseum. From there, there is a short walk to Aeroseum. As usual, visit Västtrafik for updated information about public transportation services in the area.